Only two years ago, Jillian Shippee (Shenendehowa) was setting the State Record in the Indoor Weight Throw. Now a college Sophomore, and Shippee is excelling in the Weight Throw, setting the School Record for UNC this past weekend. Shippee threw 220-1 for the win, as well as a new Personal Best. The mark encroaches on the NY Graduate Record set in 2001. Graduate Records are those set by athletes from a New York High School, and can only be set after graduation. That includes both Collegians and Professional careers. The current Graduate Record for the Weight Throw is held by Dawn Ellerbe, a HS graduate of Central Islip in 1993. Ellerbe threw 231-8 at Penn Relays in 2001. "We saw some amazing performances from our team," head coach Harlis Meaders said. "We saw our student-athletes continue to get better individually and probably the best performance of the weekend was Jill Shippee in the women's hammer throw. Her performance today should really solidify her spot in the top 10 or at least move her up in the NCAA standings so an outstanding job by Jill." 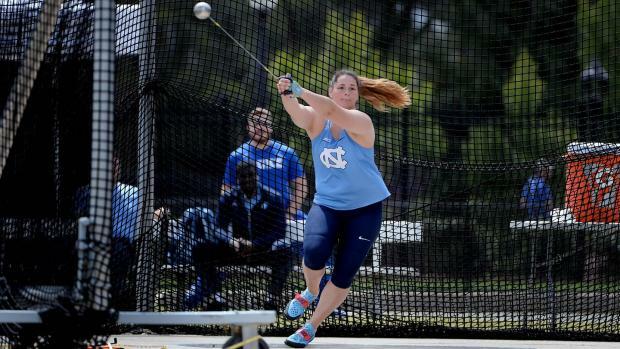 Shippee's performance marks the fourth time in her career that the New York native has set the UNC women's hammer record. Just one week prior at the Raleigh Relays, she threw 212-1 (64.65 meters) after throwing 210-6 (64.16 meters) at the USATF Junior Outdoor Championships in June and 207-4 (63.19 meters) at the Virginia Challenge in April. Shippee's mark is good for first in the ACC, second in the East Region and fourth in the NCAA. Her performance was just one of eight personal bests set by the Tar Heels across a variety of events and just one of 22 event wins for UNC.